For Lee-Ann Lalli, November 20, 2018 will always be a day she remembers with pride. In November, Lalli and the other members of CUPE’s National Child Care Working Group took to Parliament Hill, along with 100 early childhood educators, parents, grandparents, and activists to educate parliamentarians about the need for affordable universal child care and decent wages for child care workers. 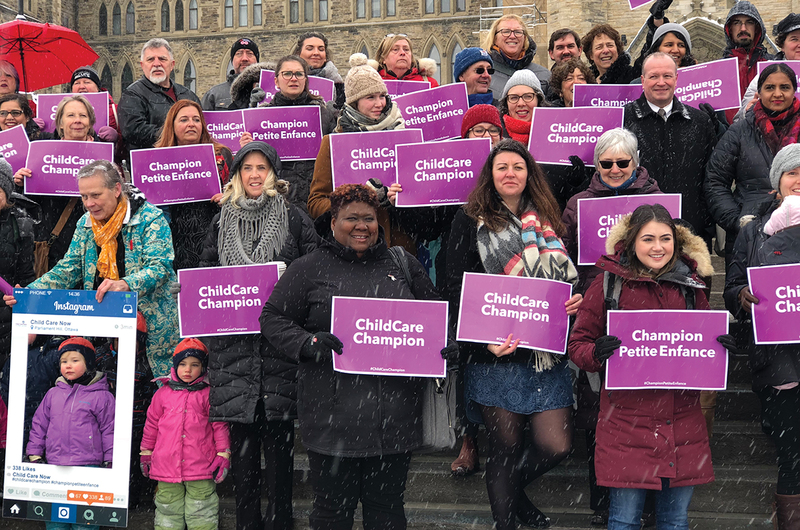 The crowd went to the Hill in search of “child care champions”—decision-makers willing to commit to a publicly funded and managed child care system, and who would support more directed federal spending on child care over the next decade. Currently, Canada spends about 0.3 per cent of GDP on child care, far short of the widely accepted international benchmark of one per cent. The lobby day was over a year in the making and was the largest the sector has seen in over a decade. Advocacy group Child Care Now organized the event with support from CUPE National. Activists met with over 60 MPs and senators, including members of every party and several cabinet ministers. Ministers heard first-hand accounts of the child care crisis in Canada from frontline workers and concerned families. According to lobby day participants, the response to their efforts was mixed. Some politicians were supportive of the issue but waived off the funding requirement, saying that one per cent GDP “is not going to fly.” Others, like NDP Member of Parliament Brigitte Sansoucy, took our members’ message straight to the floor of the House of Commons. No matter the outcome, the lobby effort helped many find their voice and renewed the hope and enthusiasm of child care advocates across the country—some of whom have been at this for decades.